You could use plain flour if you tolerate gluten but almond flour is slightly sweeter than standard flour and works well - the resultant crumb has a similar taste to the ones you can buy in the supermarket which is handy for fussy kids. We use cod or haddock. I also like coley but the kids find the taste too strong. Salmon would probably work too. We fry them in grass fed beef dripping - you could use olive oil if you are happy to use that for high temperature cooking. If we have veggie friends over we use ghee. When we buy fish from fishmongers that has expertly boned we find we can make almost perfectly shaped fingers. 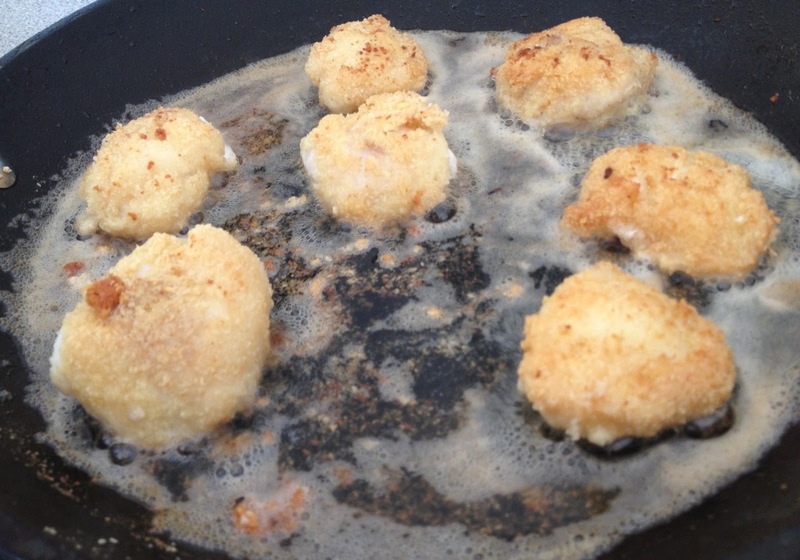 Or we buy cod cheeks from our local fishmonger Out of the Blue. They are succulent and really good value because a lot of people don't want such small pieces of fish. They are also very easy as there is no chopping involved! If it's a fish my dad has caught that I have to prep we end up with very odd shaped bites but they still taste great!